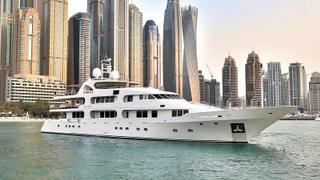 The 54 metre motor yacht Moonlight has been listed for sale by Talal Cassim and Marc Haendle at Ocean Independence. Built in steel and aluminium by Italian yard Benetti to Bureau Veritas class, Moonlight was delivered in 1984 and refitted in 1994 and 2002. A voluminous interior designed by Evan K Marshall can accommodate up to 12 guests in six cabins comprising master and VIP suites on the main deck with two doubles and two twins below. She can, in fact carry 22 guests in nine cabins. But the maximum authorized at sea is 12 guests. All cabins have entertainment centres, television screens and en-suite bathroom facilities, while a further five cabins sleep 15 crew aboard this yacht for sale. Inside the open-plan main saloon is a marble floor with polished timber inlays in bird’s eye maple, and there is a fully equipped entertainment centre including a 64-inch television screen and a Bose stereo surround sound system. Forward is a formal dining area with seating for 12 guests. On the aft deck is a large outside lounge area with comfortable seating and a table for 12 guests to enjoy al fresco dining. The bridge deck has an entertainment room with ample seating, a bar, sound system and a large television screen. It comes with polished timber flooring and birds eye maple walls with ostrich trim. Up on the sundeck is a touch-and-go helipad that can be used as a large lounge area with seating for 16 guests, covered by a large Bimini top. Further features on this deck include a barbecue grill, Teppanyaki grill, seating, a bar and a Jacuzzi surrounded by sunbathing areas with parasols. Twin Caterpillar 3512B diesel engines power her to a transatlantic range of 6,000 nautical miles at her cruising speed of 12.5 knots. Lying in Dubai, Moonlight is asking €7,950,000.